B&B: How did the collaboration come about? RC: I pretty much wrote a love letter to Lisa. A friend had given me her email address and encouraged me to contact her. I always tell my children they won't get what they want unless they ask for it, so I asked Lisa directly to work with me. I wrote "I can see an artwork talking to a little dress from the window to the rack in some magnificent way that I'm not quite sure of yet" and that was literally that. B&B: What is it about gorman's style that made you want to collaborate? RC: I am and always have been drawn to gorman on so many levels - the colour, the spots, the irreverence - but above all it is their attitude that I identify with the most. They are so unique in following their own path, making fashion that they love rather than following fashion. I love their honesty, their quirk and especially their humour. They don't take themselves too seriously yet their clothing is definitely serious enough to endure years and years in my wardrobe. When I saw the store merchandised for the launch it was everything I had imagined and so much more, just a joyous sing-dong of colour and energy. It was a very proud moment. B&B: How did you imprint your signature in the pieces that you and Rachel created? LG: I put together a bunch of shapes that I thought lent themselves to the look and feel of Rachel's work. Nothing too fitted or fiddly as I wanted the print to dominate in this collection, and clearly this has been the case. The phrases were debated around the office, over email and over the phone. 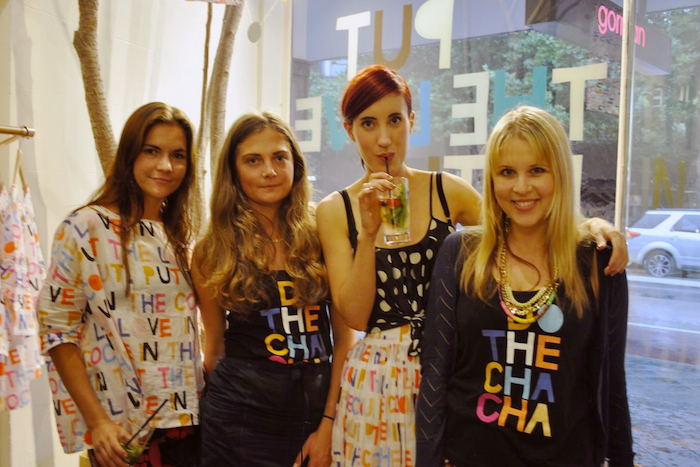 Over a few days we came up with the phrases "Put The Love In The Coconut" and "Do The Cha Cha". The idea of using these phrases for our Christmas campaign was to focus on festivity, and do something that was different to the usual concepts, like angels and snowflakes, which are a bit of a stretch from Australian fashion in high Summer. B&B: The phrases you've used seem to be quite musically inspired. Is "Put The Love In The Coconut" derived from the Harry Nilsson song "Coconut"? 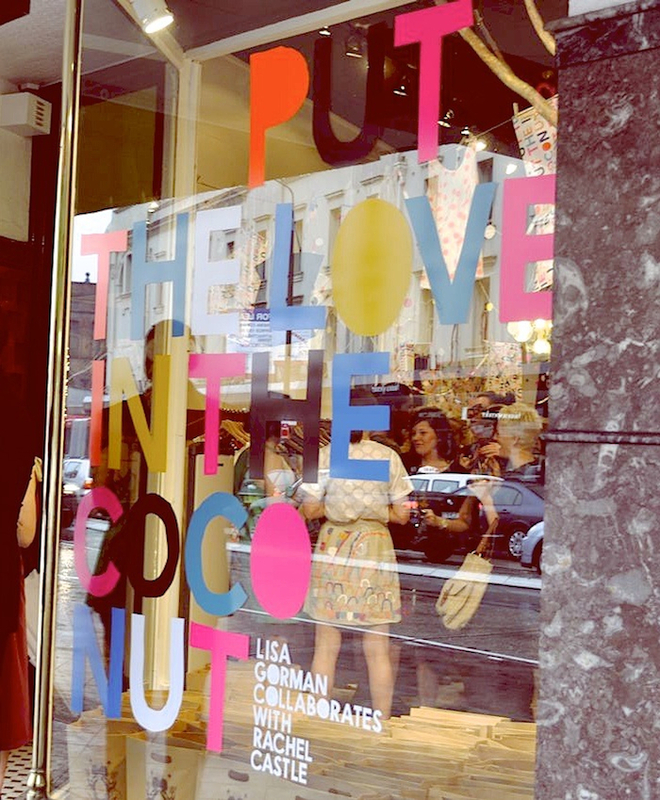 LG: Yes, this was the inspiration for "Put The Love In The Coconut". Love and lime, they're both good things! B&B: If you could do another collaboration with another designer, artist or otherwise, who would you choose and why? For more info on either or both of these super talented chicas, your mouse can do the CHA CHA. This sounds like it was really great! love the typography, the colors, the statement, all of it! yet to see their new range! from ur pics it looks colourful and summery! Thanks four your sweet comment honey! Great blog and style, SO inspiring! One of the best blogs I've seen in a while - I'll definitely follow. Great interview. 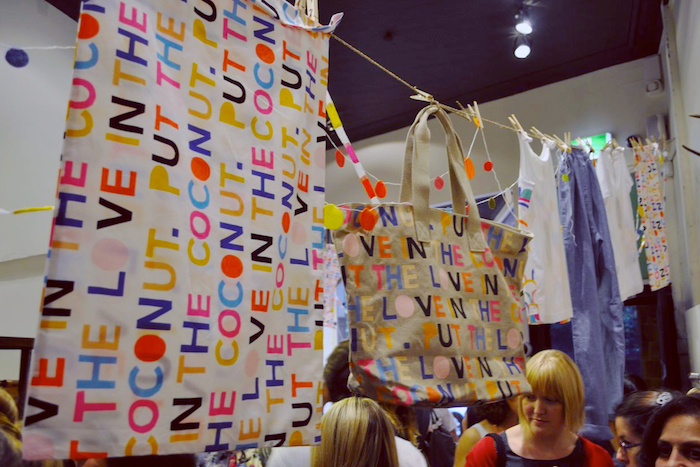 Love the tees: so fun! I love the print, so much fun! I have always liked Gorman, I would happily have every single item of her clothing in my wardrobe. Thank you so much for dropping by my blog, I'm glad you like the print. thanks for your visit and come back always! Hey! thanks for stopping by my blog because i got to know yours! and i really liked the aesthetic of your personal style pics, so i'm definitely following. gorgeous pics!!! !looks like fun!<3 thanks for your sweet words and hope u'll come visit me more often! Great post & funny pics! I love love love Gorman! Love the graphics and the colours. hahah! 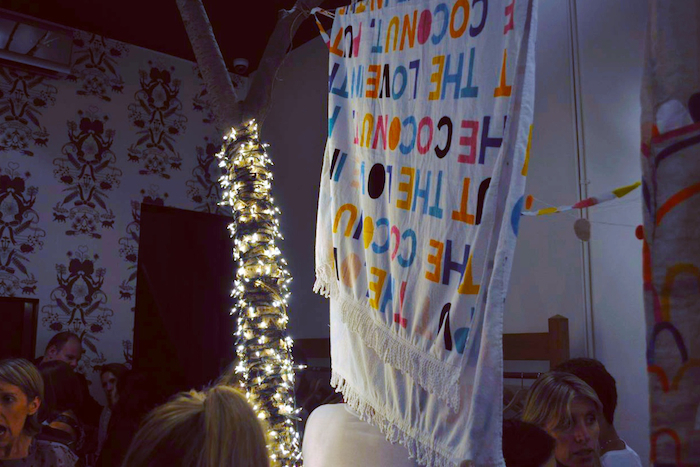 that towel is super cute totally need it! I like the use of all the letters (: Definitely worth braving the elements! the collaboration sounds absolutely amazing - i'm totally lovestruck by that colourful skirt!